Download the Contractor Saw PALS Manual. Aligning a contractor saw (with the motor hanging out the rear) can be very frustrating when done as described in most operator’s manuals. We call our solution to this problem PALS (Precision Alignment & Locking System). Hopefully, the following information will allow you to understand how the PALS are installed on the saw, and how they are used to help simplify aligning the contractor saw. 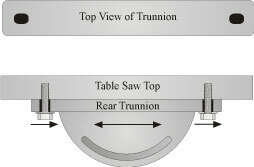 The rear trunnion on the saw has either 2 or 3 holes in it where the bolts that hold the trunnion to the bottom of the saw top pass through. (See drawing to left). These holes are slightly elongated side-to-side to allow us too have a small amount of movement as we try to get the saw aligned. During a “standard” alignment, one problem we have is as we tighten the bolts the trunnion can move erratically, which makes alignment very difficult. Typically, this movement is caused by the threads on the bolt rubbing on the sides of the holes, and can be in either direction, depending where contact takes place. The PALS kit contains all of the parts you need to easily perform an alignment on the contractor saw. We provide a pair of studs (and two pairs of nuts) to replace the original bolts. Since the studs never turn as we tighten the nuts, almost all movement is eliminated. A pair of “micro-adjusting” assemblies are included, which allow you to easily make adjustments of the trunnion. A Hex key (Allen wrench) is also included. This will be used for making adjustments of the PALS kit. 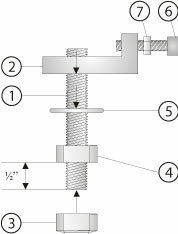 When properly installed, the PALS “micro-adjusting” screws will make contact with the trunnion ends, as shown in the drawing above. Before starting installation of the PALS kit, we recommend that you have some “semi-permanent” thread locking compound (such as blue Loc-Tite) on hand. This will be applied to the threads of the studs that will be screwed into the table saw top, and will prevent the studs from turning as you install (and adjust) the PALS kit on your saw. To insure you have the proper PALS kit for your saw, remove only1 bolt from the rear trunnion of the saw. Remove the staples that hold the clear plastic cover on the PALS package, and slide the information card out of the cover. Open the clear plastic bag that contains the PALS hardware, and thread one of the hex nuts in the PALS kit onto the bolt to confirm the threads match. If the nut threads on easily, you have the correct kit. If you can’t thread the nut onto the bolt, you have the wrong kit for you saw. Step 1. Thread one of the hex nuts (4) onto each of the studs. They should be approximately1/2” from the end of the studs. Step 2. Wrap a piece of cloth around the stud to protect the threads from damage. Using pliers to hold the stud, thread one of the Nylon insert lock nuts (3) onto each stud until about 1/16” of the stud is visible below the lock nut. Step 3. Thread the hex nut toward the lock nut, and lightly tighten them together. Step 4. Slip the flat washer (5)onto the stud, against the top of the hex nut. Step 5. Install one lock nut (7) onto each “micro adjusting” screw (6). 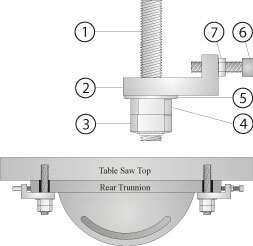 The nut should be about centered on the threads of the screw. Step 6. Thread one of the “micro adjusting” screws (6) into each of the “L” brackets (2) so about 1/16” of the threads show inside the bracket. Step 7. Slip the “L” bracket onto the stud, making contact with the top of the flat washer. wanted to insure that the studs couldn’t turn as I tightened the nuts on the PALS. when I installed the studs. I strongly recommend that you only apply 2 or 3 drops to the threads toward the end of the stud that will be threaded into the table saw top. More material on the stud will only make it more difficult to remove the stud, if necessary. Step 8. Apply thread locking compound to 1 stud, and thread the stud into the saw top. Make sure the “L” bracket is positioned so the “micro adjusting” screw is toward the outside of the trunnion. “Finger tighten” the stud. Don’t over-tighten the stud. That could cause the threads in the “L” to strip out as you try to make your adjustments. Step 9. Remove the original bolt from the other side of the trunnion, and repeat Step 8. I like to give the thread locking compound the time to “set” before I start aligning a saw, and usually give it 15-20 minutes before I make any adjustments. You can, however, start checking the alignment of the saw. If you would like any guidance as to how the alignment should be done, go to our videos and manuals on table saw alignment. One thing that you need to remember is which way the “micro adjusting” screws need to be turned to make the correct adjustment on the saw. Pulling upward on the Allen wrench will move the trunnion to your left. Pulling downward on the Allen wrench will move the trunnion to your right. I’d recommend that you go to Table Saw Tests 1-3. I’d also recommend that you watch the video clips on these tests prior to performing the alignment on your saw.